With a busy week ahead, I'm trying to stay one step ahead. Today's card is created using MJ's TechnoStamper Sketch Challenge 101. It's an easy sketch, that I see myself using again, as you can see I swapped out the Heart shape for a square panel. 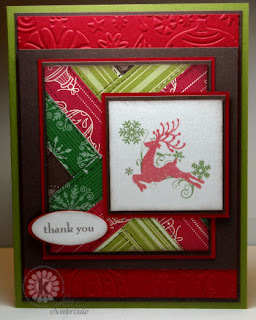 The Reindeer, Sentiment and Snow Flourish are all from the Year of Thanks II set from Kitchen Sink Stamps. I stamped the reindeer in Memento Lady Bug on White Diamond card stock from Paper Temptress, used Eclipse Tape to mask the image, then stamped the Snow Flourish in Memento Bamboo Leaves. I used the Herringbone Technique from the Current TJNL, using Stampin' Up! Merry Moments DSP, then added some Drywall Stitching with a Chocolate Marker to make it look like a quilt. The Red panel is embossed using the Ornaments Cuttlebug Folder. Thanks for stopping by, hope you're staying warm! I am luving the colors in this card, really festive! Still haven't done one of those...I know, gotta' just do it! Wow, Lisa, what a beauty!! I just ordered this set and I love the pieced background. Great patterns and colors. Love your work!! Your holiday art pieces are beautiful, Lisa. Enjoyed viewing them. Merry Christmas! Great ketch, love the use of the scraps! BEautiful card, love that herringbone technique behind your art piece. Xcellent. Wowzers! I love this. You have such a talent with matching papers and colors. Just beautiful. Great job. Thanks so much for playing!